While there are people that take it overboard (and shame on them) you'll never convince me that it doesn't have a strong influence on determining the outcome of individuals and nations. Wow, great post Brian and so very true. I see this all the time and it's truly a downer. I think you summed it up quite well and unfortunately, lots of kids are going to be in for a big surprise when they grow up. The sad thing is, we all pay for it. just 'cause it's primitive doesn't mean it doesn't work. I don't believe in beating kids, but I don't think it's ok to coddle them either. You made me laugh, and I needed a laugh. The paddle probably should not be used liberally but it still should have a place in our society. Nice post. 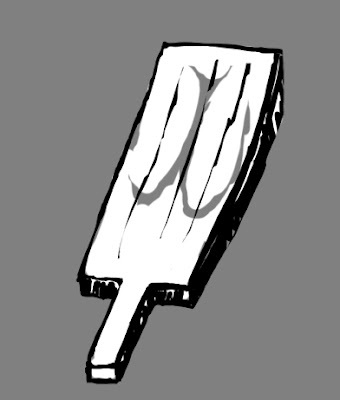 I meant for the realistic tag not to apply to the drawing of course but the concept...I had 5 minutes and felt like I needed to stand on a soap box for a minute or two...and not sure how impressive a drawing of a paddle needed to be...it's a hunk of wood for crying out loud...hope everyone has a great weekend! The one my parent's had had our names on it!!! Amen!! I think it's just as cruel to spoil a child, as it is to abuse one. hmm 8:42 ... business as usual! Ah yes, the paddle was a mainstay of my elementary-school days. That hunk o' wood never neared my hinder, but that doesn't mean I didn't fear it. Great post, you made me laugh. Your sense of humor is awesome. Great take on the topic. The godzilla is amazing too! Thanks for the link, appreciated and reciprocated!